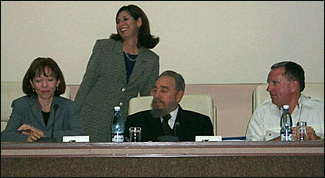 In February 2003, Alamar Associates presented the U.S.-Cuba Business Summit in Havana and Cancun. HAVANA (AP) - Dressed in black suit and tie and occasionally checking his wristwatch, President Fidel Castro left his Asia-bound plane waiting almost four hours to the tarmac late Wednesday so he could chat with more than 100 visiting Americans. 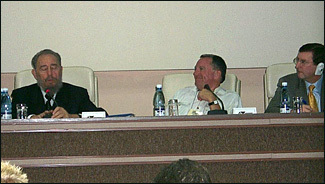 American farm representatives in town for a U.S.-Cuba business summit and a group of women business leaders from Seattle, Washington, gathered in Havana's Conventions Palace Wednesday evening for a lively question and answer session with the communist leader, participants in the meeting said Thursday. "He kept saying: 'I have to go, I have to go,' but I don't think he wanted to leave!" said Jeri Rice, board member of the Center for Women & Democracy at the University of Washington. "He was really enjoying himself." HAVANA (AP) - Cuban officials are negotiating tens of millions of dollars worth ofnew food purchases with American farm representatives who attended a U.S.-Cuba Business Conference this week, the head of the island's food import concern said Wednesday. HAVANA (AP) - Cuban officials are negotiating tens of millions of dollars worth of new food purchases with American farm representatives who attended a U.S.-Cuba Business Conference this week, the head of the island's food import concern said Wednesday. Pedro Alvarez, president of Cuba's food import-export company Alimport, told reporters that contract details were being worked out and would be announced in the coming days. "Every day there is more interest for normalizing commercial relations and travel," Alvarez said, referring to the restrictions that still remain on most American trade with and travel to the communist-run island. "This event was truly successful." WASHINGTON (AP) - Opening U.S. markets to Cuba could hurt sugar-beet farmers already facing poor prices and hamper struggling sugar production in Cuba, Sen. Kent Conrad says. Conrad, D-N.D., supports open trade with Cuba and is there this week to meet with government and trade officials. Conrad said Cuba has closed 70 sugar mills because of poor international prices. He will discuss how trade between the United States and Cuba could be opened in a way that doesn't hurt the sugar market when he meets with Cuban officials who work in the country's sugar industry on Friday.